The April unemployment report on the surface looks really good because the unemployment rate is the lowest it has been since May 2007. Yet the cause of the low rate for the month is a mixed bag. Labor participation rates also remain low. On the other hand, an alternative measure of the unemployment rate, U-6, is the lowest it has been since November 2007. The March unemployment report on the surface looked bad due too less than one hundred thousand jobs gained. But that is just one number and also not part of the report which calculates the unemployment rate and other statistics. The unemployment rate actually dropped -0.2 percentage points to 4.5%. That in itself is a decade low. The better news is the monthly drop was due to less people being unemployed and almost half a million more were working. February's unemployment report is just another no change type of thing. The unemployment rate is 4.7%, a -0.1 percentage point change from last month. Those unemployed declined slightly as did those no longer in the labor force. The labor participation rate finally hit 63.0% which is still very low The biggest movement was those employed increased by 447 thousand. Folks, there just isn't much to write home about again. January is the month when annual adjustments are added to the unemployment report. These adjustments are just tacked onto the month of January, hence one cannot compare the past month without removing these figures. Yet, with or without the annual adjustments, this year's end result isn't much of a shift. The January unemployment rate is 4.8%. Those employed had little change as did those unemployed. The December 2016 unemployment report looks almost static as changes in most of the statistics are small. The unemployment rate ticked up by 0.1% to 4.7%. Those employed increased by 63,000 a very small monthly number. Those unemployed monthly change was also relatively small. Even those dropping out of the labor force barely registered for the month. The BLS employment report shows the unemployment rate ticked down by 0.2 percentage points to 7.7%. The reason for the unemployment rate decrease is less people participated in the labor force in November. Superstorm Sandy had little effect on the monthly employment figures. The BLS employment report shows the unemployment rate ticked up by 0.1 percentage points to 7.9%. The reason for this up-tick is more people participated in the labor force in October. We love economic eye candy at The Economic Populist and this overview graphs many of the statistics from the Current Population Survey of the employment report. The DOL reported Initial weekly unemployment claims for the week ending on October 20th, 2012 were 369,000, a 23,000 drop from the previous week of 392,000. Last week's initial claims were originally reported to be 388,000, a 4,000 upward revision. The DOL reported Initial weekly unemployment claims for the week ending on October 6th, 2012 were 339,000, a 30,000 drop from the previous week of 369,000. From pundits to politicians, people are freaking out for this makes initial claims the lowest level since February 16th, 2008. It's like someone pulled the unemployment rate out of a Star Trek transporter, as if America entered a time warp machine and we moved to another dimension through a worm hole. A 0.3 percentage point drop to 7.8% makes no sense when there were only 114,000 jobs added. Captain, can the unemployment rate be right and we really did defy the laws of statistics? We want to point to something which might in part explain what happened this month with the household survey statistics. That is how long someone holds a job. We don't have monthly statistics on job tenure, yet it could very well be that finally, people are working longer at a job. The never ending Schindler's List attitude towards U.S. workers may have abated. The U.S. has disposable worker syndrome, where people are laid off and fired for no damn good reason at all. It's a fact of the American work life while one has a job one week, there is no guarantee one will have a job the next. 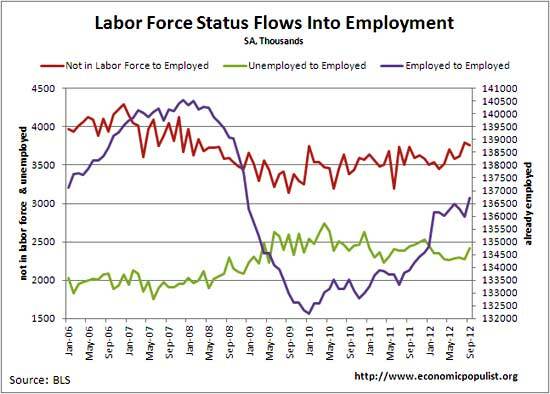 To wit, let's look at another obscure BLS statistic, labor force status flows. This is the number of people flowing from being in the labor force, out of the labor force, employed and unemployed on a monthly basis. Below is a graph of the monthly changes of people who moved into employment from already having a job, not being counted at all, or being part of the official unemployed since 2006.